That also means 2006 has maintained its hold on second place and remains the only year other than 2017 to have surpassed the 40,000-sales mark. 2018 pulled in 486 sales short of the 40,000 mark and 532 less than the 2006 total. And so far, it looks like 2019 is unlikely to challenge 2017 or 2006. There were only 1,867 sales pending at the end of the year, signaling a substantial drop in sales for January. There were 2,471 sales pending going into January 2018. That marks a 24 percent drop for this year. That’s all the Andrew Terrell, new president of the Greater Nashville Realtors, needed as he settles into the chair that is heating as sales are cooling. Terrell comes from good stock, as they say. His father, Jim, is a long-time principal broker in the area and the owner of Pilkerton Realtors. The elder Terrell served on the Great Nashville Association of Realtors (GNAR) board of directors for eight years and would have been president if he had so desired. He chose not to climb the ladder that was offered. Jim Terrell has been Realtor of the Year and served as an officer on the Realtracs board of directors. With that lineage in place, Andrew Terrell is considered by many to have the potential to be one of the greatest presidents to serve in that office. He is quoted in his first press release saying, “2018 proved to be one of the best markets in Middle Tennessee history,” adding the local economy is strong and interest rates are low. Compared to 1981, when rates hit 18 percent, or even in the 1990s, when they dropped to 9 percent, rates are low. Only two years ago, however, buyers could lock 3.875 percent in for 30 years. Last week, rate for a 30-year, fixed-rate mortgage was 4.45 percent. Upper-end homes – $1 million or more – were the stars of 2018. When the ball dropped on New Year’s Eve, Davidson County had totaled 391 sales of $1 million or more for the year compared to the 347 the previous year, according to Realtracs. Condos did ever better with 25 closings of $1 million-plus in 2018 compared to 17 the year prior. Her throne and crown are in jeopardy with the mother-daughter team of Yvonne Kelly and daughter Caroline Rigsby representing the 505 development and brining in the sales. With 13 more upper-end 505 condos on the market, they will have a head start on the rest of the pack going into 2019. With another interest rate bump or two on the way in 2019, inventory on the rise – 10,791 at year’s end compared to 9,011 at the same time the year before – look for sales to lag in outlying areas, especially in new construction. The city has been buried in new construction during the past few years. With some of those homes aging, many buyers are encountering the usual lifestyle changes will be moving. Since the prices have been on the rise the past several years due to higher lot costs, higher material costs – some even higher now with tariffs – and rising labor costs, the homes that were built two or three years ago can undercut the prices of new construction. For example, a 2,000-square-foot home built in 2016 could have sold for $500,000. A newly constructed home of the same floorplan and similar might have sold for $550,00 in 2017 and $599,000 in 2018. In 2019, that home would have to sell for $650,000 for the builder to make the same money as he would selling it for $500,000 in 2016. Here’s the rub. Those that bought for $500,000 in 2016 can sell for $600,000 in 2019, make $100,000 and beat the new construction price by $50,000. The house at 1607 18th Avenue South sold again last week. Some will remember this as the residence of the beloved and respected Betty Nixon, who died in 2016. Nixon was the first woman elected to Metro Council and the first woman to run for Mayor. Her residence sold for $1.3 million in 2016, and the new owner spared no expense in renovating the home, restoring the hard-carved mantel and reworking the “quarter-sawn oak floors,” restoring the windows and adding three new HVAC units. Additionally, he updated the kitchen with a 48-inch Wolf stove and a Sub-Zero refrigerator. He added a 400-amp electrical service, and a tankless water heater. To go along with the 6,382-square-foot home, he sold the adjacent lot along with the house for the tidy sum of $2.9 million. The lot is actually a triple lot, but the seller only mentioned the availability of one. Dave Havercamp of Crye-Leike was the listing agent and a person of the same name is listed as the owner/seller. 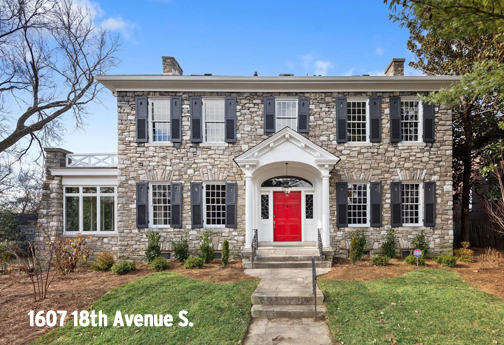 Beth Molteni, an industry leader, represented the buyer in the transaction for history-filled home in the shadow of the Adelicia, the condominium project where Beth led the sales efforts for the wildly successful project. Richard Courtney is a licensed real estate broker with Fridrich and Clark Realty and can be reached at richard@richardcourtney.com.